Agree that you will find no women who like to watch the process of skin aging in the mirror. Through the ages our natural skin becomes less strong, elastic and tight. So, we start looking for ways to prevent the early signs of aging as wrinkles and fine lines. Of course, you can achieve perfect results attending cosmetologist regularly and getting skin rejuvenation procedures. But a lot of women want to get smooth and lifted face and neck zone faster and for long. Today it is not necessary anymore to get invasive plastic surgery. We at Anna Esthetics know the way to return your youthful appearance without scalpel and long recovery period. First of all the procedure of thread lift appeared in the world about 10 years ago. In that time aestheticians used gold and platinum threads made from inert material. The effect was visible but not for long. Women complained on swelling, bruising and allergy reactions. Using pdo threads is a spreaded technique in South Korea, Europe and South America. Now in the USA we nearly two years have a modern board certified method which is minimally invasive. The whole procedure lasts for about an hour and it also needs special preparations. Before the operation our clients get professional consultation with a specialist. They together discuss and choose the most optimal variant of lifting depending on the skin issues and concerns. Because of the local anesthesia the process of threads inserting isn’t painful. Polydioxanone (PDO) is a suture material which can dissolve inside skin during several years. Threads are not smooth, they have notches, which allow to control their elasticity. Such a method of skin tightening is completely safe and doesn’t cause allergies or irritations. PDO suture absorb inside slowly dissolving through years. During this time threads support and lift your tissues, making wrinkles less visible. long lifting effect by the supporting frame of threads under the skin. 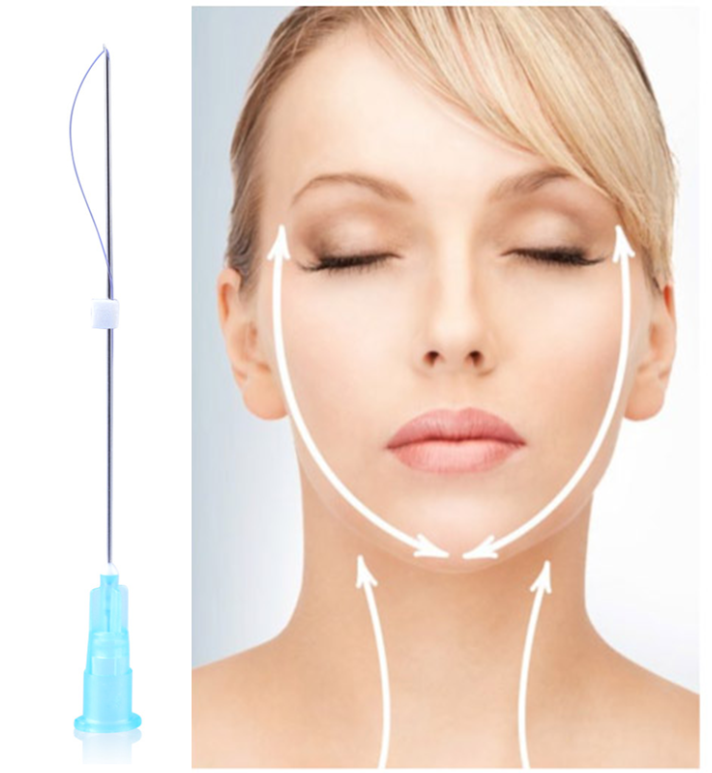 PDO thread lifting has a lot of advantages comparing with plastic surgery of face and neck lift. First of all, it takes less efforts, no general anesthesia and no need in stationary surveillance after. That is why the procedure is less expensive. Minimum invasion inside skin means minimal side effects and recovery period. Because of this, you shouldn’t get special post treatment. All unpleasant aftermaths, which you can get are light bruises and micro hematoma. Usually they are completely gone after 2-3 days. In this time you should be more careful with regular skin care not to cause irritations to sensitive harmed face. The main advantage of this technology is that inserted threads boost your natural collagen production and make cells renew themselves. This effect lasts even after the full absorption of the material for additional 3-6 months. The procedure of PDO lifting is suitable for women after 40 years. But in some cases you can get the treatment even in younger age. Threads can minimize some ageing signs but can’t eliminate acne scars or other defects. So, it will be the best variant for those, who have not many wrinkles or deep fine lines. Then, the result would be better and more visible. Mainly such a treatment get ladies with started ageing processes as loss of elasticity, skin sunkening, gravity effects. There also is a list of health states which forbid you to get the PDO lifting. First of all, it is pregnancy and lactic period, while your body is too sensitive and demanding. Oncology, bad blood clotting, diabetes and individual allergy reactions are the main factors which don’t allow to get the treatment. Sometimes you also shouldn’t hurry to visit an esthetician while suffering of exacerbation of an infectious disease. So, if you don’t want to see plastic surgeons and have a long recovery period, PDO lifting is for you. See you in our Tampa beauty center Anna Esthetics!